WASHINGTON — The Trump administration is weighing a plan to send hundreds of captured ISIS fighters to an Iraqi prison after other countries refused to take them, and to send several of the highest-value fighters to the U.S. detention facility in Guantanamo Bay, according to five U.S. officials and two European diplomats. Sen. Jeanne Shaheen, D-N.H., worries that sending the militants to Guantanamo would potentially turn them into martyrs. She has called on the Trump administration to prosecute those suspected of killing Americans in federal civilian courts to ensure they face justice. A spokesperson for Sen. Shaheen said she has advocated for the ISIS killers of journalist James Foley "to be tried in federal courts in accordance with the wishes of the Foley family." Republican Sen. Lindsey Graham, a member of the Judiciary Committee, wants to see the two "Beatles" sent to Guantanamo as a temporary move before a possible trial in a civilian court in the U.S., a series of moves that would be prohibited under existing law. The prisoners who may be destined for Iraq or Cuba would be drawn from a group of about 600 currently held by the U.S.-backed Syrian Democratic Forces in a rebel-controlled area of Syria, say the officials. Many of the detainees are foreign fighters, and range from foot soldiers plucked off the battlefield to the highest value detainees who were tracked and captured with help from the U.S. military. The SDF, a majority Kurdish militia in northern Syria, has accumulated the prisoners over months of fighting, creating an increasingly challenging situation. The SDF continues to fight a complicated war and doesn't have the resources to detain, prosecute or protect hundreds of prisoners. In July Sens. Graham and Shaheen visited the prison where the SDF is holding the detainees. A spokesman for the National Security Council declined to comment on options for detained foreign fighters or the "disposition of specific cases." "Our partners in Syria are detaining terrorists who were captured or surrendered, including many foreign terrorist fighters," said the spokesman. "All options will be considered. The president and his national security team will pursue the option that best protects the national security interests of the United States." The State Department would neither confirm nor deny that such a move is among the options the administration is considering. "We encourage all of our partners to take responsibility for their citizens, including prosecuting them for any crimes they've committed, and ensuring they cannot return to the battlefield. We will continue to pursue all diplomatic avenues. We have no further specifics to provide at this time," a State Department spokesperson told NBC News. Asked about the possibility of sending ISIS prisoners captured in Syria to Guantanamo, Pentagon spokesman Cdr. Sean Robertson would not discuss specific individuals, but said, "DOD's detainee policy provides our warfighters guidance on nominating detainees for transfer to Guantanamo detention should the individual present a continuing, significant threat to the security of the United States." Cdr. Sarah Higgins, a Defense Department spokesperson who focuses on detainee policy, said, "There is no one identified to transfer to Guantanamo at this time." The U.S. has struggled for months to send the prisoners back to their countries of origin. U.S. officials started lobbying other countries to accept some of the detainees at a meeting of defense ministers in Rome in February. Earlier this year, the U.S. sent letters to a number of countries, including the United Kingdom, France, Germany, Gulf nations, and others – nearly four dozen in all - informing them the SDF is holding their citizens. The letters included names and as much personal identifying information as possible for each person. The letters said the SDF could not hold these fighters long term and arrangements needed to be made for transfer and continued detention. At first, no country agreed, according to the five U.S. officials, with one characterizing the response as "mixed." Over the next several months the U.S. convinced several nations to repatriate their citizens. Earlier this month, Macedonia took seven fighters, and Lebanon took custody of eight. Two senior U.S. defense officials confirm that both Tunisia and Kazakhstan have expressed some willingness to take custody of fighters being held in Syria. In the case of Tunisia, they may be willing to take more than 150 prisoners, but they want compensation. Nathan Sales, the State Department's coordinator for counterterrorism, was due to travel to Algeria, Tunisia, and Morocco this week to discuss "foreign terrorist fighters" among other issues, the administration said in a statement on Monday. But other countries have continued to decline U.S. requests. And another issue is the nearly 2,000 women and children – wives and kids of ISIS militants imprisoned or killed in fighting – who are now held in refugee camps. Their home countries don't want them back for fear they could bring radical ideology with them. The home countries fear "later radicalization of the children, mental health issues from what the kids have lived through, especially the teenagers, and concern the women may have been radicalized as fighters," according to one U.S. official familiar with the discussions. Human Rights Watch, which has tracked the status of the detainees in northern Syria, has appealed to the United States and its allies to ensure the ISIS fighters are brought to justice, but in a way that adheres to international law. The group recently criticized Washington over the transfer of eight of the detainees to Lebanon, saying the move raised the risk the men would be subject to torture and unfair trials. The U.S. is still searching for a solution, but now is considering sending the fighters to a prison in Iraq. One official explained this would "alleviate some of the security concern" that the prisoners could escape. Another official said holding the detainees in Iraq as a transit point also eliminates the need for their home countries to enter Syria to collect them. Among the prisons under consideration is the detention facility at al Asad Airbase in Anbar Province. The U.S has discussed this option with the Iraqis but at this point does not have an agreement, according to three U.S. officials. 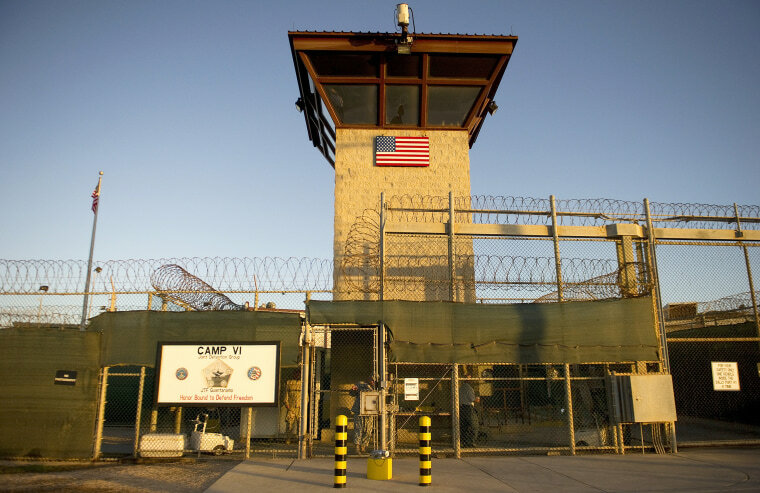 The U.S. hopes to have access to the detainees to question them, said the officials. Although the detainees would most likely be in Iraqi custody, with the U.S. maintaining access for interrogations, what would come next for the detainees is less clear. Several U.S. officials said the U.S. would continue working to get their home countries to take them back and prosecute them at home. Others could potentially be prosecuted by the U.S. or held indefinitely. There's an open legal question about whether detainees picked up on the battlefield in Syria could be tried in Iraqi courts. Iraqi law only provides for trying suspects who were operating with ISIS inside Iraq, say legal experts. Iraq would be a problematic option for the detainees, given the country's track record with its mistreatment of detainees and court trials plagued by a lack of due process, rights advocates said. "We would be very worried. Torture is rampant in Iraqi detention facilities," said Nadim Houry of Human Rights Watch. There is also a real danger that a plan to temporarily hold the detainees in Iraq could unravel, and morph into an indefinite detention without any prospect of a trial, he said. "When does it turn into an arbitrary detention?" said Houry, director of the terrorism and counter-terrorism program at Human Rights Watch. Transferring detainees to Iraq could amount to "punting responsibility onto Iraq," he said. The Trump administration is considering sending some of the highest value ISIS detainees, like "Beatles" Kotey and Elsheikh, to the detention facility at Guantanamo Bay, Cuba, according to five U.S. officials. The most infamous Beatle was Mohammed Emwazi, aka Jihadi John, who was seen on videos beheading prisoners, including Americans James Foley and Steven Sotloff. He was killed in a 2015 drone strike. The fourth Beatle, Aine Lesley Davis, is in a Turkish prison. Kotey and Elsheikh are both from West London but the British government has reportedly stripped them of their citizenship. The U.S. submitted a waiver request to the British Home Secretary weeks ago asking them to allow the Beatles to be turned over to U.S. custody and be eligible for the death penalty, according to two former administration officials and a Western diplomat. On July 23, Minister of State for Security Ben Wallace said "we are not talking about U.K. citizens" when referring to the two men during a debate in Parliament about extradition of foreign fighters and the death penalty. Wallace reiterated the U.K. government's opposition to the death penalty and its belief that Guantanamo should be shuttered, but also said the U.K. had "taken the rare decision" not to seek assurances from the U.S. that the Kotey and Elsheikh would not face the death penalty before it agreed to share evidence against them with U.S. authorities. Daniel Fried, who was the Obama administration's envoy for closing Guantanamo Bay and is now at the Atlantic Council thinktank, said sending prisoners to Cuba "was the stupidest thing I've ever heard and I hope we don't do it." "The reason is once we do that, we own the problem and we have no solution. And then you can never let them go because of all the legislative restrictions." President Obama had pledged to close the detention center at Guantanamo but there were still 41 detainees there when he left office. Fried had a different opinion about sending prisoners to Iraq. "[That] doesn't sound wacky to me at all, if you're going to work with the Iraqis to make sure they are treated in a humane fashion and have sufficient resources to help the Iraqis move them to their countries of origin. The countries should own their own people."